Because Google now allows hosted files with a directory structure from Google Drive, I have updated this script to utilize Google Drive. You no longer need Dropbox or any other hosting solution. Also, you no longer need to name your images with numbers. The script will find any image file with any name. You just need to make sure you type the name correctly, enclose it in double square brackets and include the extension. 5. Click "Yes, make a copy". 6. On your own copy click Form -> Edit form. 7. Create a form as you usually would. Where you want an image to appear, just type the image name enclosed in double straight brackets. For example [[myimage.jpg]]. You should be able to include images anywhere in the form. 8. After saving and closing the form editing window, go back to the spreadsheet and click 'GFWI', then select 'Create Form with Images'. You will have to authorize the script the first time you run it from a spreadsheet. 9. That's it! A link to your form should pop up. Here is a video that Brian Weinert created demonstrating the process. Thanks Brian! If you have any troubles, please let me know here or on Google+. Is there any trick to the appearance of the GFWI tab in the spreadsheet section of the copy?? This is a great process and I am following all of the instructions but the GFWI tab doesn't appear. Any ideas?? I don't know why it wouldn't appear. When you say tab, you mean the menu item at the top that says GFWI, right? And you are clicking the above link and creating a copy, right? That menu item will only appear if you make a copy. Please let me know and I will investigate further and help get this working for you! Not sure what I was doing but it seems to be all happening for me now. Thank you very much for sharing this. Hi, do you think it's possible to make the script work with page breaks? When I add a page, the images only appear on the first page of the form. Sorry no, it will only work on single page forms. That is just the nature of the way I created the script. Making it work with multi-page scripts would be fairly complicated, but it is something I will take a look at when I have time. My client wants to be autonomous creating some surveys but I guess I'll have to find some other solution. Thanks James, it took me two tries. The first time I ran the script and the images (jpg's) didn't show. I went back in and added the extension (.jpg) to the images and it worked. I noticed on your sample you did not have to add an extension. Is it different based on image type? I am glad it helped, but sorry, the send via email feature will just use the standard link that doesn't have images. If you are wanting to embed the form with images into an email, you could copy the source code and paste in into the body of the email. This is a good feature to suggest and I will definitely play around with embedding the form into an email. I shouldn't be that hard. I always include the file extension because I thought you had to. I didn't realize you could leave the extension off and it could still work. But if you are having troubles, I would recommend just including the extension. This is awesome, thanks! I've noticed that it has issues if you choose to automatically collect Google Apps usernames (requiring a sign-in) then you end up with a sign in screen and a "browser doesn't have cookies enabled" message. Any way around this? Thanks for pointing this out. I hadn't considered that this might not work, but it makes senses that it doesn't. I will take a look when I get a chance and see if there is anyway to resolve this. This is fantastic. I am a middle school principal. This will allow math and science teachers to really USE forms for assessments. Many thanks for sharing this script! Dan - Thanks for the feedback - it is great to hear that this is useful for other educators! Hi, I'm having the same issue of Kim Brown. I'm following all the instruction and I made a copy of the spreadsheed may times but the "GFWI" tab doesn't appear. Could it be because I'm using the italian version of Google Drive? Thanks in advance. I am not sure why it is not appearing. Would you open the copy of GFWI and go to Tools -> Script Manager and tell me what, if any, scripts are listed? Thanks and sorry for your trouble. I don't think it should matter what version of Google Drive you are using, but I could be wrong. I watched the video and tried creating the form as instructed, when I click the link to view the form I keep getting "Not Found: Error 404"
Nevermind, I had the root folder spelled, "GWFI" I made the fix and it worked. Adam - I am glad you figured it out! Sorry for the delayed response. It has been a busy week. I am trying to put an image as the header. B. I followed your steps and GFWI doesnt come up as an option after I save. ok well I figured out that I need to use your form to start but is there a way to either bring your code into the form I already created or to bring my form into your easily without retyping everything. Even though I re-ran the script something must be happening. 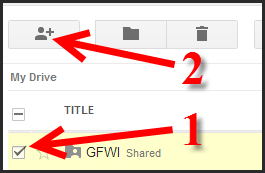 1) Did you create a folder called GFWI? 2) Did you share that folder and make it public? In regards to bringing the code into your form, it is certainly possible. Open up my GFWI v6 spreadsheet. Go to tools -> script editor. Make sure you are on Code.gs. Copy all 96 lines of code. Now go into your existing form. Go to tools -> script editor. Select Blank Project, and paste the code into that sheet. (Make sure you paste over the existing code.) That should do it. I may have left something out. Give it a try and let me know if you need more help. HI, this is great stuff! Thanks for the video. I followed your instructions and was able to insert two pictures in my form. However, the nice formatting of the form is now gone. Any idea how I get the formatting back? This is on my list of possible improvements. I am not very good with CSS, but I need to find a way to make the forms look a little better and/or maintain some of the existing formatting. I will let you know if I make any progress in this area! Some one told me about it for this script ... change the “#gid=0” in the link to "&newcopy". I was amazed too! I have already created my form, is there a place from which I can get the script. I cannot find it in the gallery. Thank you so much. I am just starting out using scripts...so very cool. I applied to have this put in the gallery, but I was denied. For the next version I am going to put it in the Chrome Web Store. To get it into an existing form, open up my GFWI v6 spreadsheet. Go to tools -> script editor. Make sure you are on Code.gs. Copy all 96 lines of code. Let me know if that doesn't work or if you need any help! I am guessing you are using the new forms and that is causing the problem. Let me know. I may have to update this to work with the new form. Yes :)last week I played with your script without trouble and now while I like the new Forms....it does mean headaches. Not sure it will even let me use old forms...unless of course I just use your form and recreate. I followed the step by step instuction but got an error message. do i have to download google drive to my computer? can't i do it from my web drive? Can you tell me what error message you are getting? No you don't need to download the google drive application. I think this is amazing ! I am trying to change the size of the image. Do I need to do it prior to uploading into the img file ? I checked out the code and did not see any numbers, just the link. Also, is there only certain types of images that work with this script? For example, my jpg shows up but not my TIF. Thanks again so much. I am just learning about scripts but clearly have a lot to learn! Thanks for feedback - I am glad it is useful for you! In regards to your questions. You can change the size of the image and add it to the GFWI\img folder. Just delete the original and give the resized version the same name as the original. The html file that the script generates creates an image tag, and it will just check that folder for a file by that name. So if you keep the name the same, there is no need to generate a new tag. My understanding is that most browsers will render, png, jpg, gif and bmp, but not tiff. Sorry about that. I hope my explanations make sense. Let me know if you have any more questions. There was a bug with Google Scripts, that is now resolved. Please try running it again and let me know if it doesn't work. Also, there is a new version you may want to try out. If I understand correctly, there is no way to add image into google form unless it's html link?? no option to add to a regular form, and so better view? That is correct. The only way for this to work is to take the html from the original form, add the image markup, then host the new html file somewhere else. I do plan to play with the css and do what I can to preserve the original look at some point. How do I embed the form? Thje form is created but after a selection is made and the submit button is pressed, you're redirected to the form with the [[pic.jpg]] options. none of the options are selected and it says: "Looks like you have a question or two that still needs attention." First, Great Tool that has helped out a lot. Thank You. I too am seeing similar behavior as Mr. Sandick on a required multiple choice with 7 options each containing an image. Make selection, submit and it behaves as if no selection was made: "Looks like you have a question or two that still needs attention." with the multiple choice options in highlighted in red w/o images. If I remove options 6 and 7 it behaves as expected and records response. Thanks again. I appreciate your work! thanks for your script. It's working fine for me but when I try to insert my image in the title, I get a HTTP 404 Error. So I assume it's not possible to insert images at this place but is there any workaround ? Hi James, I came across your script after shared this page on one of the groups I am connected with. Excellent script and one that will prove to be useful. One item, would it be possible to include a size function for the images? As I see the image in my form at full res which in some cases may be unsuitable without editing in another application prior to copying into the img folder. actually - it was a required question - so i changed it --- it appears to not be recording that question to the spreadsheet. all other questions work just fine. I cannot get the script to work. Whenever I try it says "ReferenceError: "DocsList" is not defined" I don't know what that means. I followed your instructions. Same Issue Here. Have you figured out the fix? Same issue- Would really love to use in my classes. Any idea what I am doing wrong? Thank you! ReferenceError: "DocsList" is not defined.